It’s 1860 in the State of Missouri. When all the votes are counted, three men have been elected that will change the state forever. Claiborne Fox Jackson becomes the state’s Governor. Frank Blair is re-elected to represent Missouri’s First District in the United States House of Representatives. And Abraham Lincoln becomes the 16th President of the United States. In 1860 slavery, of course, is legal in the state of Missouri. Missouri, along with the other Border States, is key in Lincoln’s initial policy that the coming war is not about freeing the slaves. Abraham Lincoln is convinced that he must keep Missouri in the Union. Fortunately, the large majority of Missourians agree with him. They are against war and just want the status quo to continue. Volume 2 of Trans-Mississippi Musings tells the story of two minority groups on opposite ends of the political spectrum. One group, led by Claiborne Fox Jackson, is convinced that Missouri’s destiny lies with the Southern States of the Confederacy. The other faction, led by Frank Blair, will stop at nothing to keep Missouri in the Union. 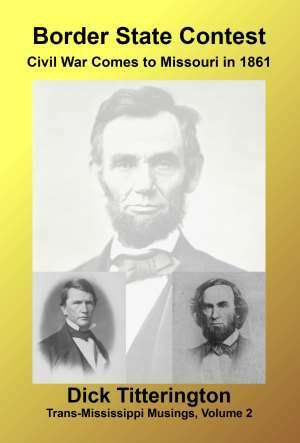 Beginning with the 1860 elections and ending with the Battle of Carthage, this book tells the stories of the decision makers and the individuals who carried out their decisions. Who made the decisions that dragged Missouri into the American Civil War? What decisions were made that changed the State of Missouri forever? Will Claiborne Fox Jackson succeed in goal of seeing Missouri secede? Will Frank Blair succeed in his goal to keep Missouri in the Union? Find out in Volume 2 of Trans-Mississippi Musings.